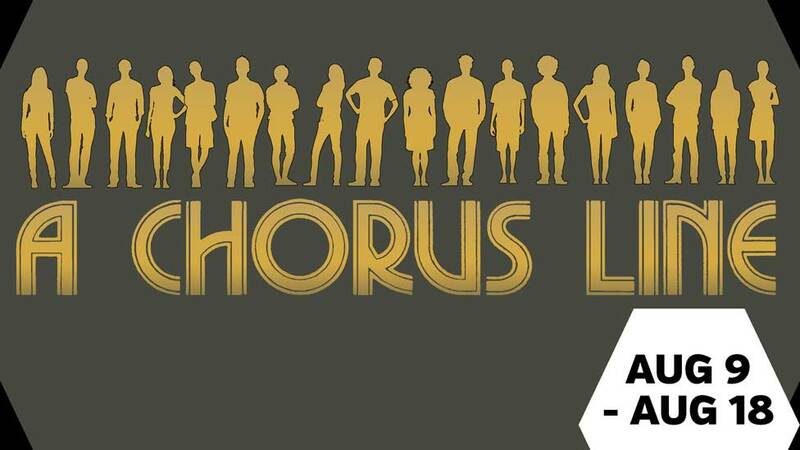 A CHORUS LINE is a celebration of those unsung heroes of the American Musical Theatre: the chorus dancers- those valiant, over dedicated, underpaid, highly trained performers who back up the star or stars and often make them look even more talented than they are. It is also a celebration of the American Musical itself. A CHORUS LINE is also about competition, and competition might easily be the common denominator that grabs the audience and holds it by the collective heartstring until the final, ultimate choices are made. For everyone, at one time or another, puts his life on the line. We all compete, no matter what business we're in, for promotion, for attention, for approval and for love. Specifically, A CHORUS LINE takes the audience through the final grueling audition run by the director, Zach, for a new Broadway musical. At the beginning of the show, Zach, a driven, compulsive worker, has assembled thirty semi-finalists and is putting them through a vigorous series of dance combinations, including ballet and jazz. Soon he thinks this group down to the final sixteen, eight boys and eight girls. They and the audience know that eventually this number will be cut in half and Zach will choose only four boys and four girls to be in his new musical. Instead of having them read a short audition scene, Zach wants to elicit a personal history from each one: how they got into show business, why they became dancers, what their hopes, fantasies and aspirations are. As he calls upon them individually, they react in every possible way, from bravado to reticence. From childhood on, their memories emerge, blending into a seamless series of musical numbers and monologues, some humorous ("Dance: Ten; Looks: Three"), some poignant ("At the Ballet"), some group reminiscences when they all share their adolescent experiences ("Hello Twelve, Hello Thirteen, Hello Love") and some intimate, as when he calls upon Cassie, his former lover who has returned from California to ask for a chorus job after having been a featured performer ("The Music and the Mirror"). As their individual stories pour out in song ("Nothing") and in spoken words (Paul's monologue), interspersed by learning dance routines that reveal their ability to perform as a faceless drill team ("One"), the audience, as well as Zach, gets to know each one of these ambitious entertainers individually, so that by the show's end, they can identify and root for their favorites as well as empathize with all of them because they all need the job- they all want to work at their craft. A CHORUS LINE departs from the usual glossy backstage musical by presenting a true picture of what it's like to be in the theatre: glamorous, yes, at times, but also tough, heartbreaking and sometimes even tragic, in the case of Paul who is knocked out of the competition by an injury sustained during a dance number ("The Tap Combination"). After these brave dancers explain why they go through a life filled with rejection and injury ("What I Did for Love"), Zach makes his selection, eliminating the last group who reluctantly leave the stage. The lights soon fade on the remaining eight ecstatic dancers as they are told to prepare for rehearsals of their new Broadway show. They fade only to come up as each performer, now dressed in full, shimmering finale costume, reappears to receive an individual bow before joining together to perform the brilliant dance finale ("One") and showing exactly the talent it takes to make it into a chorus line. Original Broadway production produced by the New York Shakespeare Festival, Joseph Papp, Producer,in association with Plum Productions, Inc.